Artists: Ashley Culver, Frank Hallam Day, Elsabé Dixon, Alex Ebstein, Shané K. Gooding, Stephen Hayes, Christopher K. Ho, James Huckenpahler, Jean Jinho Kim, Mike Mandel and Larry Sultan, Guy Miller, Evan Reed, Allan Rosenbaum, Rachel Rotenberg, Foon Sham, Joe Shannon, Chad Stayrook, Hillary Steel, Judit Varga, Elizabeth Zvonar, bees, The Punk Rock Flyer and Zines (from the archives of Cynthia Connolly, Dischord Records at the University of Maryland at College Park). In celebration of its 30th Anniversary, VisArts presents an exhibition in four galleries that explores the power of visual art to transform. Eleven curators selected a single work of art, a small curated group of artworks by multiple artists, or an art experience that addresses art’s ability to shift social, cultural, or personal forms. This exhibition was created in the spirit of sharing experiences and opening conversations about the “work” of art as a spark or trigger for conversions spectacular and subtle in both makers and viewers. Weekly public tours on Saturdays and Sundays at 1 PM in all galleries. Schedule a private tour for your group during our gallery hours. To schedule your tour please complete and submit the tour request form. DIY-Punk Rock Fliers and Zines: Concourse Gallery (2nd floor), during regular gallery hours.DIY-flyer and zine-making table with instructions in a take-away zine by John Davis, publisher of Slanted zine, musician and the Performing Arts Meta Archivist at Special Collections in Performing Arts (SCPA), University of Maryland at College Park. Pollination Panel Discussion: Sunday, October 7, 1:00 – 3:00 PM, Beall-Dawson House, 42 West Middle Lane, Rockville, Maryland (walking distance from VisArts). Discussion on beekeeping, pollination, and the intersection of living systems with art. Special guests to be announced. Parking available on the street and in a small nearby parking lot. 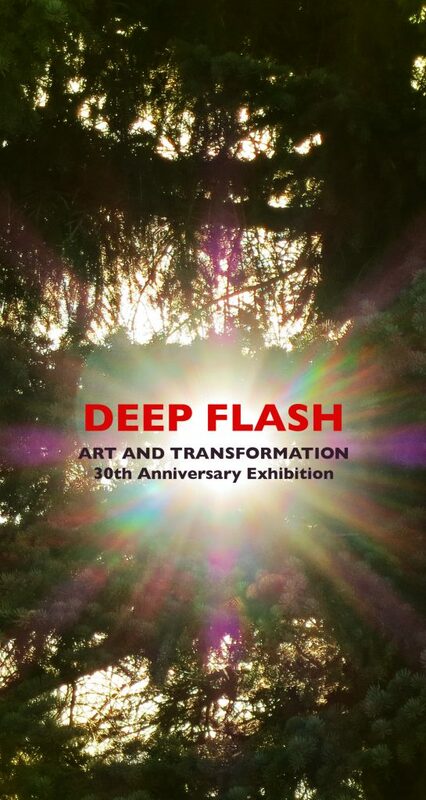 Deep Flash: On Art and Transformation: Digital catalog available for download or print copies. Essays on art and transformation by all guest curators. Were you transformed by art? How? When? Where? Tell us your story. Instructions for submitting your story HERE. Exhibitions and events are always free and open to the public. Suggested Donation is $5.00.